I have explained in detail on differences between Passive and Active Optical Network in my previous post .In this post, I will continue to write on Passive Optical Network (PON) technology standard. The figure above show the model of GPON network. OLT is located in Service Node Interface (SNI).OLT is the starting point for GPON network and is connected to Service Node. OLT is a power equipment that manage and distribute data from and to subscribers .OLT uses Gigabit Ethernet technologies to transmit and receive data from Service Node . An example of Service Node is a router . OLT is connected to Optical Network Unit (ONU) through Optical Distribution Network (ODN) .ODN use Wave Division Multiplexing (WDM) technology to transmit data from OLT to ONU. GPON use different wavelength in WDM to transmit and receive data for its uplink and downlink .I will explain more details on GPON fundamental in the next post. The fiber is then split and distribute to subscribers premises using passive optical splitter .Passive optical splitter normally is located by the road side either inside a manhole,duct or a pit . 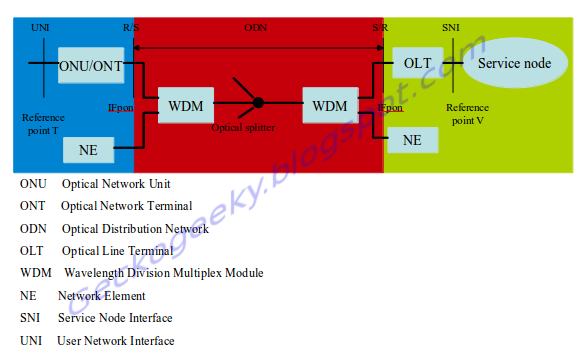 There are different type of Optical Distribution Network (ODN) deployment depending on how Service Provider plan to do it.But the main idea remain the same in which to connect the physical layer of the network from OLT to ONU. PON standard is divided to two, EPON and GPON. EPON is a technology base on ethernet and GPON is a technology that gradually developed from Asynchronous Transfer Mode (ATM) transmission.Both of these technology have their own strength and weakness depending on what Service Provider plan to do in their network. 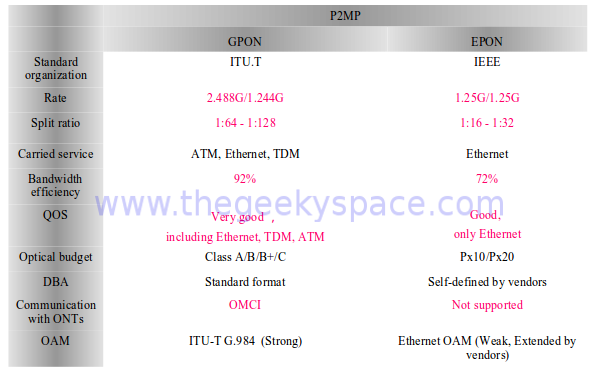 Below diagram show the differences between EPON and GPON . Why GPON is prefered over EPON? Between both technologies, GPON is preferred by global Service Provider because of several reason . 1. Longer transmission distance: Transmission over optical fibers reaches the maximum of 20 km transmission distance. 3. Optical split feature: The single optical fiber from the CO is split to multiple drop optical fibers to save the resources. 4.GPON supports the triple play service. It provides full-service solution to solve the bandwidth bottleneck of twisted pair access, and to meet the requirement for high-bandwidth services, such as high definition TV and live show. GPON is the best choice for the triple play service. In the next post, I'm going to share more details on GPON fundamental technology.Stay tune. What do you think about this post? Please left comments in box below.